If sea kayaking were a person it would be the one that everyone wants to be friends with; who always knows the right things to say, is great at a party and comes top of the class. Sea kayaking is Mr Popular of the watersports world. Whether you’re five years old or 105 and whether you like to take things slow or live life in the fast lane, sea kayaking will get in your groove and suit your style. It’s our most versatile activity and requires absolutely no prior kayaking skills. Sea kayaking we salute you. 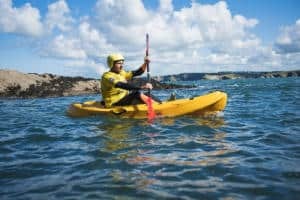 Here’s what to expect and what to look out for when you have a sea kayaking lesson in Newquay with us. First things first, you need to get kitted out with the right equipment and clothing. 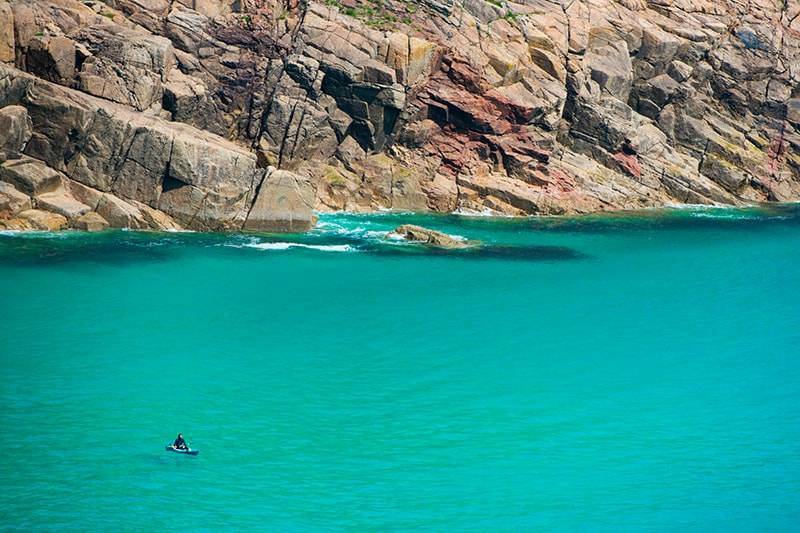 We’ll sort you out with a wetsuit, helmet and buoyancy aid then pair you up with a paddle and a sit-on-top kayak. We offer a choice of one or two person versions with the latter being perfect for children and adult combos. Whichever option you go for you can expect to be treated to a comfortable and leisurely ride thanks to the comfortable back rest that comes as standard across our kayaks. Comfort equals confidence on the water after all! Before we get going on our ocean adventure we’ll make sure you’re familiar with the equipment and fill you in on the basics of kayaking skills. You’ll also learn essential hand signals, clue up on what to do if you get tired on the water and gain ocean and wind awareness. It’s all super important but don’t worry, we’re pros at helping beginners get to grips with sea kayaking so you’ll find it easy peasy even if you have zilch prior knowledge. We’ve lucked out with our position on Towan Beach in Newquay because we’ve got not one but three amazing kayaking routes on our doorstep. So what do you fancy, a tour of Newquay’s beaches, the lagoon stillness of the Gannel Estuary or the tea cavern caves of the Gazzle? They all sound good don’t they? And they are. Whichever one you go for our expert team knows it like the back of their hand and will guide you to all the must-see nooks and crannies. They’re also chocka with info and depending on your interests will cover off the area’s history and heritage, the flora and forna and wildlife. Oh, and if you’re up for it will throw in a few games and challenges too. Paddle race anyone? 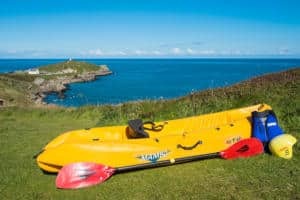 See Newquay’s coastline from a different perspective from the seat of a kayak. You’ll set off in the swell from Towan Beach and start paddling once you’re past the harbour mouth. The ocean is then your oyster. 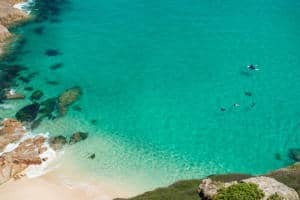 Each tour is slightly different depending on the weather conditions, tide and group preferences but gear up for secret beaches and unique experiences such as paddling around the iconic island on Towan Beach and you won’t be disappointed. 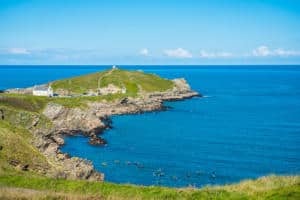 If you’re a bit of a history buff or fancy throwing yourself back into Newquay’s smuggling past get kayaking to The Gazzel, a 2km stretch of Atlantic coastline where tales of piracy and shipwrecks abound. 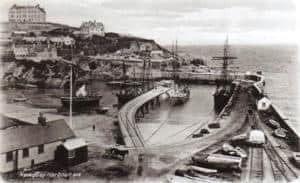 You’ll see Huers Hut on Towan Headland which lived its glory days as an important part of Newquay’s pilchard fishing industry, and hear how it was in this area that wreckers used to draw in ships ready to plunder. Thankfully, these days The Gazzel is a lot more mellow and is the perfect playground for learning to negotiate swells and waves. 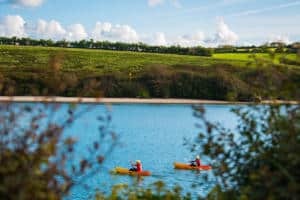 Teaming with wildlife and sashaying with incredible good looks, the Gannel Estuary, just south of Towan Headland where the Gannel meets the sweeping sands of Crantock Beach, is a kayakers dream. 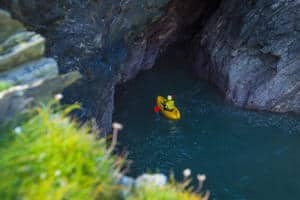 Enjoying a sheltered spot tucked away from the buzz of Newquay’s popular beaches, it’s lovely and peaceful offering the perfect conditions to get the hang of the art of the paddle. Keep your eyes peeled because on a sea kayaking tour with us you’re guaranteed to encounter an array of marine wildlife. 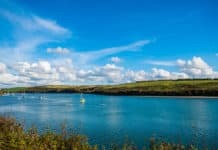 From the sand banks and salt marshes of the Gannel Estuary to the still water of the harbour, wildlife loves Newquay as much as we do. 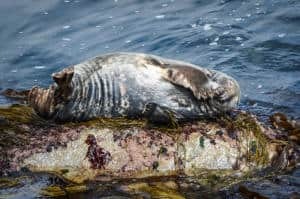 Seals, otters, Kingfishers…it’s all up for grabs and we’ll help you to identify it. Find out more and book your kayaking adventure with us. 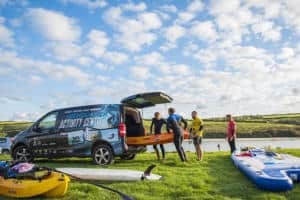 Next articleWhat is Stand Up Paddleboarding?